I’m what I would call a ‘nostalgic eater’ – which means that everything I love to eat, cook, and bake is inspired greatly by a memory or person that I’m connected to in my life. 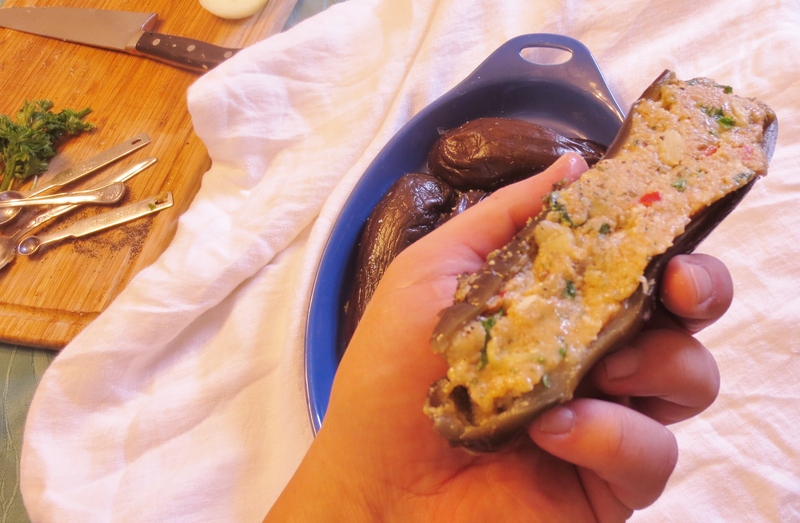 These stuffed eggplant are no exception, and in fact, I would say they are the quintessential example of nostalgic eating. I was too young to even recall my first memory of them, and in the course of my lifetime, I have eaten a version of this savory and tangy fried piece of yumminess from every matriarch on both sides of my family. 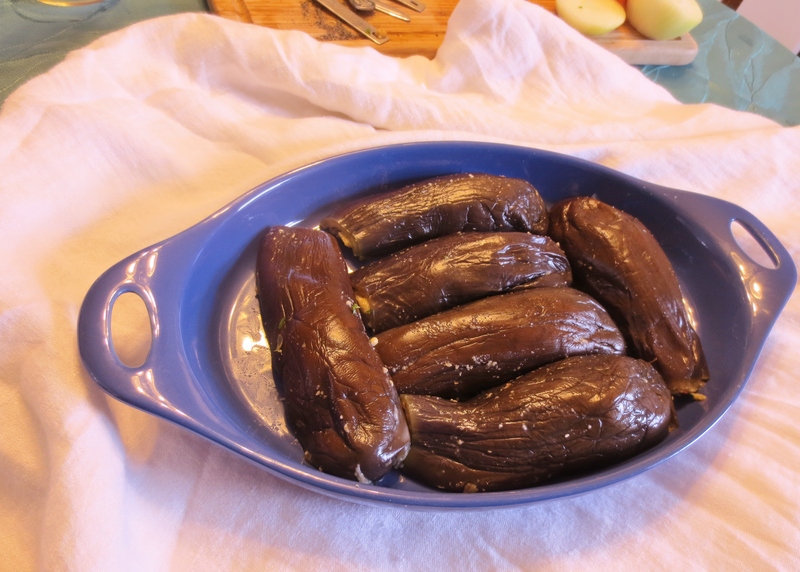 These stuffed eggplant, or ‘Melangiane Chini’ as we refer to them in Calabrese (Melanzane Ripiene in Italian), are another timeless tradition of Southern Italian cooking and of my family. Everyone’s version, like so many other recipes that I share, tastes just a little different, but the essence is always there, being that robust reminder of a special place, person, or time in life when you bit into the crispy outer layer and sank your teeth into the smooth, soft stuffing, and finished by biting the familiar and delicious skin of the eggplant. Hands down, my Mother’s are the best, followed in close second by my Zia Concetta’s, both of whom inspired my recipe and still make these for me today (I know I can make them myself, but they taste even better when Mamma makes them). Fill a large pot with water and boil on high. Cut the tops of the eggplants, removing the stems, and then slice in half. 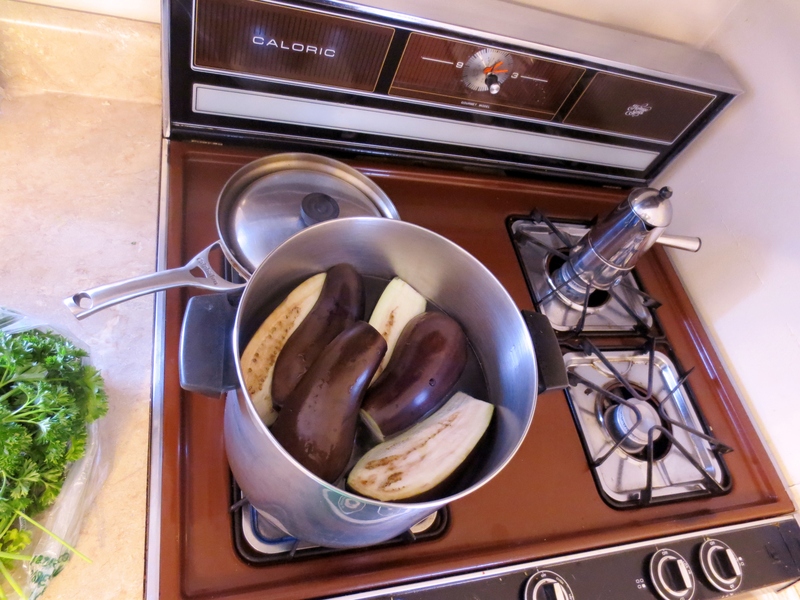 Submerge the eggplant halves into the boiling water for about 10 – 15 minutes, or until a fork easily pierces the eggplant. Set aside to cool in a bowl of cold water. Once cooled, scoop out the inside of the eggplant, creating a ‘boat’ shell – careful not to scrape too much from the sides or to puncture the boat. 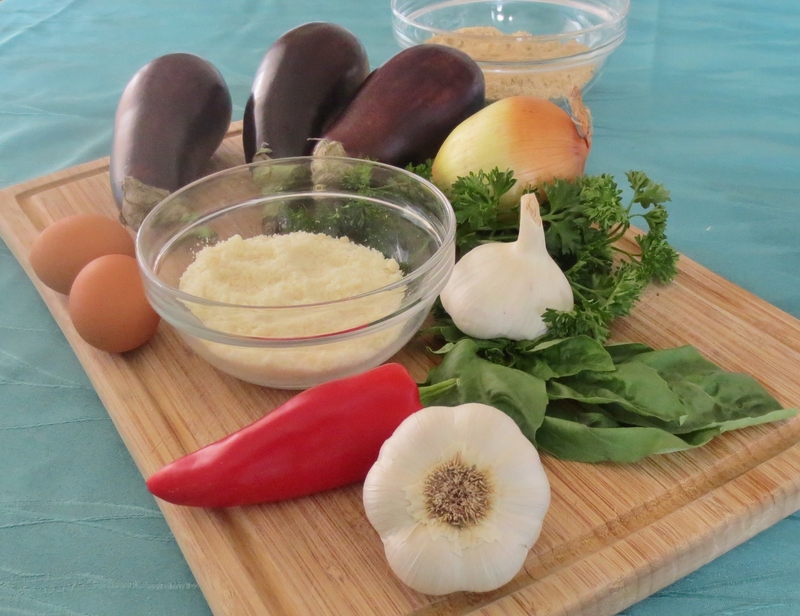 Chop the eggplant insides into small, uniform pieces and add to the ground meat in a medium bowl. Add the minced red pepper, onion, garlic, parsley, basil, eggs, black pepper, and grated cheese. Mix with your hands while slowly incorporating the bread crumbs. Avoid ‘overworking’ the meat mixture, but be sure all ingredients are well dispersed. 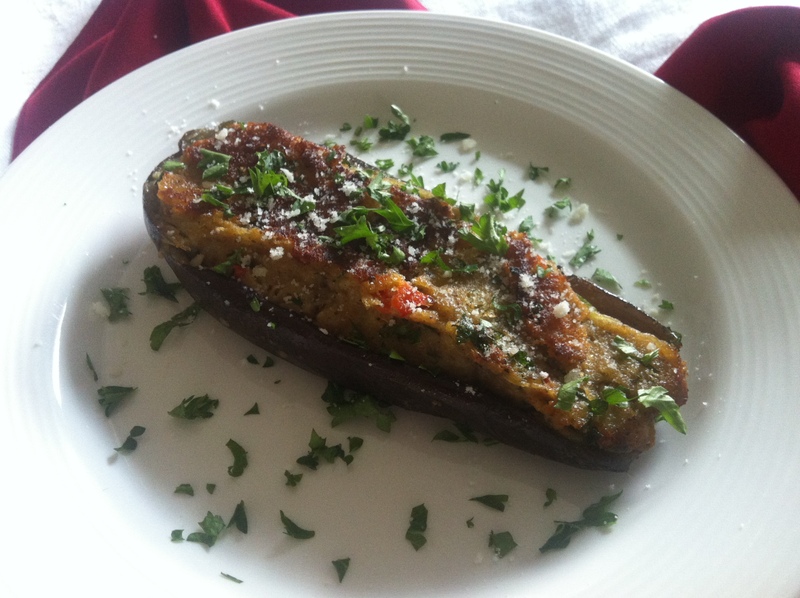 Dry off any excess water from the eggplant boats and fill each boat by hand with the stuffing mixture. The filling should arrive just at the rim of the eggplant shell. After filling all of the boats, refrigerate for about 10-15 minutes, stuffing side up. Fill a large frying skillet about half way with oil and heat over medium. I prefer extra virgin olive oil, but you can also use vegetable or canola. Once the oil is heated for frying (you’ll see little bubbles start to rise), slowly fill the skillet with the eggplants, stuffing side down. Fry for about 4 – 6 minutes or until a golden brown crust has formed. Gently flip each eggplant, and cook an additional 4 minutes. Remove from pan and drain excess oil by placing on a paper towel lined plate. Garnish with grated Parmiggiano or fresh cut parsley. Thank you so much! Give them a try – the simple, natural ingredients pack a punch of savory flavor. Nothing like a ‘old-school’ stove, right? try baking the stuffed eggplant, adding grated boiled egg to the stuffing, cover with tomato sauce and mozzarella – that’s how my mom prepared it. Yum! That sounds delicious. I’m a big fan of hard-boiled egg with sauce and cheese. I’m definitely trying this! Thanks! There is no chop meat in the ingredient list, but it says to add eggplant to the chop meat. How much and what kind of chop meat? My mother and father are both Calabrese and these are just like my mom’s with the chop meat of course. Hi Vivian – sorry for the delayed response. I’ve relaunched the blog and just getting to this. Yes, ground beef works well (I like to use a 93%). For this recipe, you can add about a 1/2 pound of meat, salt if needed. This is a typical Calabrese treat – hope you try them and they taste just like your family’s. Buon Natale! I can see these on the menu when the farmers market is in full swing and the eggplant is jus off the vine. Yum, and thanks so much for sharing!